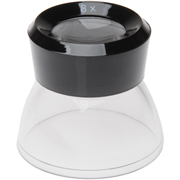 The Dotline DLC 8x Magnifier Loupe features a molded black finish grip. It measures 2 inches high with a 1-inch diameter lens. This 8x loupe is magnified 8 times to see fine details and is the perfect size for viewing photographic proof contacts sheets, slides and negatives.